Local fans were out in the hundreds as they came out to witness Solomon Islands’ first senior international since the FIFA World Cup qualifier loss to New Zealand three years ago. Expectations were blank as neither side could be placed above the other despite Solomon Islands sitting higher in the FIFA Coca Cola World Rankings. Toata, clearly overjoyed with the result was full of praise for his players for a job well done but also admitted that there are areas which need improvement. “Firstly, I want to acknowledge my boys and thank them for their hard work this afternoon. They held on to our game plan despite the challenges and ensured that we finished with a victory,” says Toata. His counterpart, Flemming Serritslev, congratulated the winning team but pointed out that his side did pick up in the second half. “Congratulations to Solomon Islands for the win; they deserved the win today,” Serritslev says. “My side made mistakes and allowed our opponents to control most of the first half. I think we played better in the second half but initially we played with too much respect and should be more challenging,” add Serritslev. 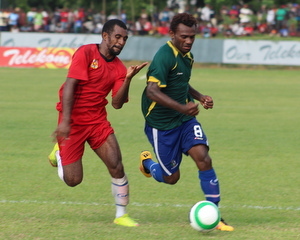 Solomon Islands took the lead after 9 minutes when an attacking ran by defender Fred Fakarii was not fully cleared by the Papua New Guinea backline. Moffat Kilifa, who was lurking on the left wing picked a quick pass from Micah Lea’alafa before crossing to Totori who fired found the back of the net from just outside the eighteen yard box. The lead was extended by Nawo in first half stoppage time and Solomon Islands took the break with some degree of comfort. The second half was more even and Papua New Guinea were able to string passes together and occasionally threaten the Solomon Islands goal. Papua New Guinea’s Tommy Semmy, whose gaining a Pacific wide reputation as one of the fiercest strikers, attracted a lot of interest from the Solomon Islands defenders whenever he had the ball. On the other end of the park no further lack was received by Solomon Islands despite James Naka entering from the bench with promise. Naka almost got on the scoreboard midway through the second half but saw his attempt blocked. Nawo also threatened to add his second of the match with minutes left on the clock but sent this shot too high from a rather close distance. The duo will meet again this Sunday to conclude the friendly series.